« Who is Doing the Research? Lifespan: Depends on my gene pool – 8-15 years. Height and weight: You’ll find out when I grow up. Color: What you see is what you get. Historically, mixed breeds were the result of female dogs on the loose while in heat being bred by unknown males. More often than not, these accidental pregnancies were given away to neighbors or at the SPCA. Most standard breeds come from a working background that required certain physical traits which helped man in some way so the intentional breeding of a “mutt” served no purpose. The recent fad of “designer dogs” actually started years ago. Since we’ve been in business, cocker-poos and peke-a-poos have been recognized mixed breeds that are sought after and their existence has been recorded as early as the 1950s. With the growing popularity of specific breed mixes, we now we have a whole industry starting up. What used to be an accident is now done on purpose with a puppy price tag ranging from $1,000-$4,000 (compare that to purebred puppies which sell between $500 and $1000 from breeders who do extensive genetic testing). Welcome the Labradoodle, Golden Doodle, Yorkiepoo and Puggle! There are now professional organizations for mixes that mirror their purebred counterpart—the AKC. The International Labradoodle Association was established in 2004 and like the AKC, it has instituted standards which included genetic testing for the health of all of their 1,300 registered dogs. The idea of the “designer dog” is to create a “best of both worlds” dog which incorporates the best traits of each dog into a new dog. For example, the Golden Doodle could be a dog with the straight coat of the Golden and Golden personality but with the low-shedding of the Poodle which is sometimes considered a hypoallergenic dog. However, it is important to note that the puppy of two breeds being mixed may resemble either of those breeds. Mary F. Burkovich, a Labradoodle breeder in Pittsburgh says that “there is no guarantee that Labradoodles can be tolerated by people with allergies. My own dogs range in size from 32 pounds to 50 pounds.” She further states that while the Labradoodle parents she is currently breeding have curly poodle-like coats, some of the puppies’ coats are much more like that of a Labrador—short with lots of shedding. When looking for a mixed breed puppy, be sure that you love the traits of both breeds being mixed and are not counting on a specific trait from one breed to override a trait in the other breed. Another potential benefit ascribed to the mixed breed dog is “hybrid vigor,” the theory that cross-breeding produces superior traits in the offspring. Mixing up the gene pool should also avoid the medical issues that pure breeds develop from inbreeding, line breeding, and a thinned genetic pool. Unfortunately, hybrid vigor is not yet fully understood. Veterinary Partner and one area of the scientific community suggest that hybrid vigor only applies to the first generation—so the puppy of a Labrador and Poodle would be superior in genetic traits compared with either of the parents but the puppy of two Labradoodles would not be and would be subject to any genetic defects of either parent. Hybrid corn does not have this problem and consistently yields more and responds better to fertilization than conventional corn but the opposite can occur as well. Outbreeding depression is the term used to describe genetic incompatibility shown in offspring. The mix between wild and hatchery fish has been shown to result in fish which are unable to survive. Adult mixed breeds have already grown into their traits—what you see is what you get—so if you have concerns about what traits you would be able to live with, an adult may be the way to go. The SPCA is a great resource for adult mixed breed dogs. It’s difficult to describe a groom for the mixed breed because there is much more variation between the size and shape of mixed breed dogs whereas the more predictable purebred dogs have a standard grooming style. In dealing with a variety of sizes and coats, owners can pretty much dictate how they want their dog to look. Most mixes look more or less like one of the standard breeds so we can use that haircut as a basis to start from. For example, a Cocker Spaniel mix that looks somewhat like a Cocker would be able to be groomed in the Cocker pattern. Personality cut: This haircut allows ease of maintenance and is the most economical. The body is cut with clippers to a length between 1/4 and 3/4 of an inch in length all over except for the head, ears, and tail. The head has scissored bangs, thinning sheers in front of the eyes, a beard that is cut short to please and long ears. The tail is flagged and scissored to please as well. Summer cut: This is a popular cut for dogs that have coats like a Golden or Setters. On all breeds or mixes, clipping the groin and rounding the pads is standard. For our summer cut, we scissor the legs, chest, rear feathers and tail to about two inches in length. This makes weekly brushing a breeze. Brushout: If you like the way your dog looks and only need his pads and groin done, a good brushout may be all that’s necessary. Recently some tools have come on the market that do an excellent job of removing undercoat, allowing your dog to not only feel cooler, but shed less as well. Lab and Shepard types can benefit from this groom. Some of our favorite clients are mixed breeds, each one is incredibly unique—you’ll never see the same dog twice. For us, what counts is personality and behavior! 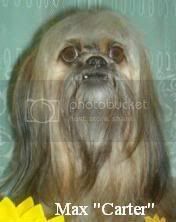 This entry was posted on Tuesday, April 17th, 2007 at 10:20 am	and is filed under Breeds: As Related to Grooming. You can follow any responses to this entry through the RSS 2.0 feed. You can leave a response, or trackback from your own site.